My niece is most assuredly the cutest thing I've ever seen. Miss Natalie has everyone wrapped around her little fingers, so I decided to make something sweet that wraps around her little head this Valentine. Sadly I'm not going to get to see her this Valentine, but her Daddy assures me he'll send me lots of pictures. 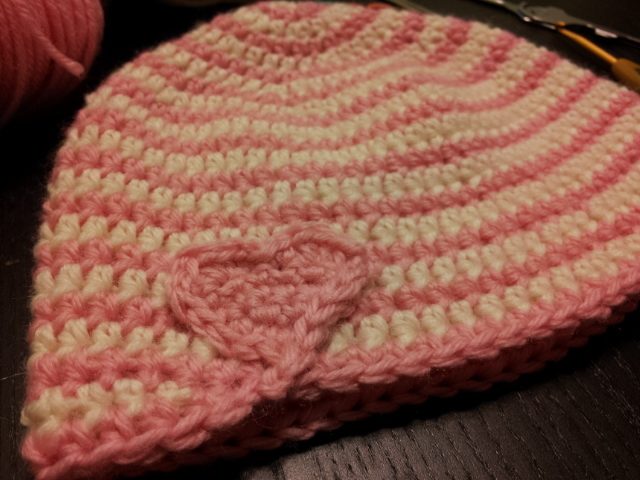 This hat is worked top-down in a continual spiral of four different strands of yarn, finished with a cute little heart attached to the side. 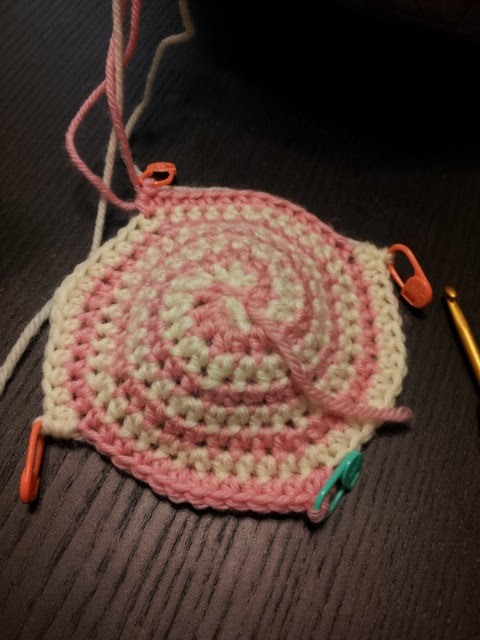 I worked with only two colors, working from both ends of each skein and alternating the colors white, pink, white, pink. Feel free to work with four unique colors instead, or alternate them as you see fit. 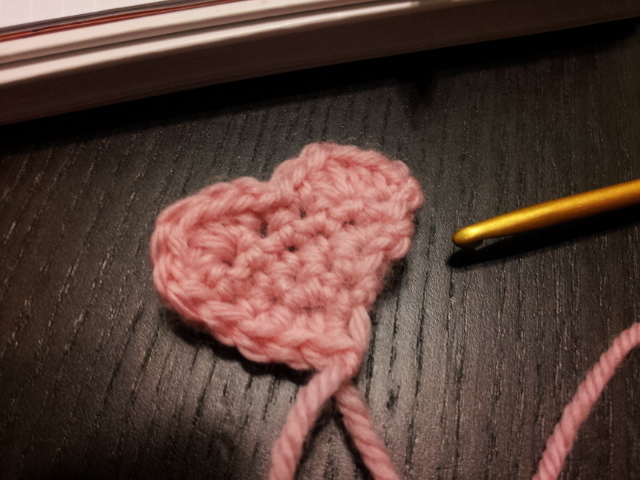 Just keep in mind that your last color will be the one that forms your brim and the attached heart. A note on size: My niece has a big noggin', so this hat might be a bit big for the typical 1 year old. Feel free to work more or less increase rows, as you see fit, to get the size you desire. If you do want to adjust the size, make sure to work more/less plain rows as needed as well. R1: Using A, make your Magic Circle and ch1, hdc 2 into ring. Put marker in loop, remove hook and switch to B. Attach B and hdc 2 into ring. Put marker in loop, remove hook, switch to C. Attach C, hdc 2 into ring, place marker, remove hook, switch to D. Attach D, hdc 2 into ring, place the unique marker (this marks the end of the round) & remove hook. 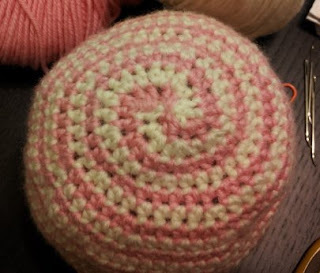 Tighten the Magic Circle so that all the stitches are in a tight circle. You should have 8 stitches. From here on out, you'll work the four strands in a spiral pattern, always crocheting into the color before it. I found it helpful to count and make sure the distance between each of the markers was the same at the end of a round. Use the stitch markers to hold the live loops of the strands you aren't working. The unique marker helps you remember which strand is your last one for that round. R9 - ? 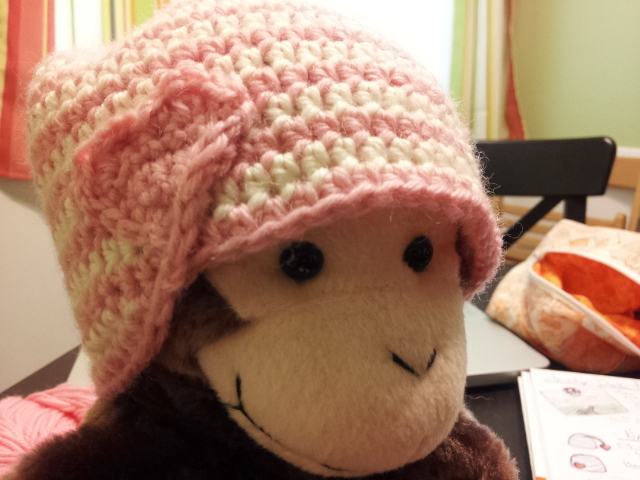 : Work in just plain hdc in every stitch around until hat measures 5.5". Measure in the middle of two stitch markers, as the hat is larger where the markers are. Once you've reached the length you want, bind off all the strands but the last by doing an sc, then a ss, cutting the yarn and pulling it though the last stitch to tie off that color. 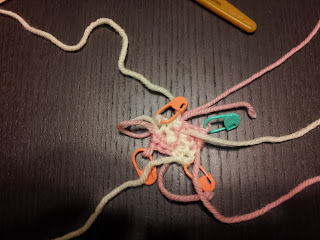 Then, work plain hdc around with the last strand, stopping when you run into the strand. Sc, then ss, then chain 2 and put the marker in the loop & remove your hook. Make the heart below. Work in the same color as the last strand, using the other end of the skein. 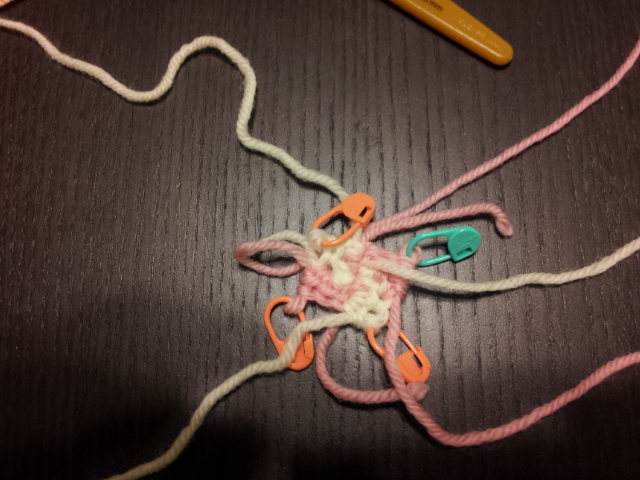 Ch 2, turn and 2sc into 2nd stitch from hook. Ch1, turn. 2sc in both stitches, ch1, turn. 2sc, sc, sc, 2sc, ch1, turn. sc across all 6 stitches, ch1, turn. *(ss & sc) in first stitch, (hdc, dc, hdc) in 2nd stitch, (sc & ss) in 3rd stitch. Repeat from * for last 3 stitches. Don't turn. Ss down the left side of the heart, finishing at the point. Cut yarn and bind off. Remove the marker from the last loop on the hat and put it back on your hook. Now, sc along the right side of the heart, stopping when you reach the first hump of the heart, where the stitches already look finished. Cut the yarn, leaving a 10" tail and pull through the loop. 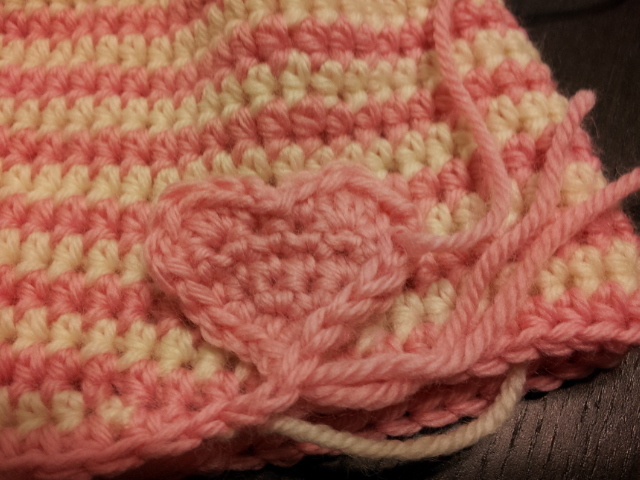 Position the heart where you want on the hat, using the images on this page as a guide, and sew into place using the tail. Once that's all done, weave in all ends and BAM! You're done. Place on baby and admire. I don't have a baby, so I used my monkey.